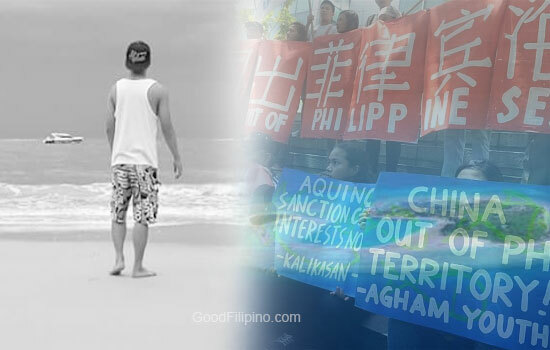 In an open letter created by Netizen named 'Balweg Labra,' he point out carefully his thoughts about the Scarborough Shoal issues on China and the results of the ruling from the Arbitral Tribunal. But here's what Balweg said in his open letter to China. AN OPEN LETTER FOR CHINA. PLEASE DO SHARE MY AND YOUR SENTIMENT. We, Filipinos though live in an archipelago too small compare to your land area and big number of population plus powerful defense, will never step back a single. We, know what is ours! We know how to die with love of what is ours. Rest assured, the moment you start bombing us, you will never enjoy the war. Why? Because, we are all ready to die protecting our sovereignty, than to live under your cruelty without national identity of patriotism. You might have nuclear bomb, we only have .45 Caliber but this stuff would be enough proof that we, as a country will shed our blood as a living ink marking the name Philippines to those areas you illegally claimed and occupied. It is not that we have U.S of A as our allied. It is not that probably we have the majority of nations favored us in the Permanent Arbitrary Tribunal. It is with or without them we knew first and foremost what we are fighting for and we cling to this noble struggle. As our asian neighbor since this world was created, history can tell how deep is our relationship since time immemorial. This intimate friendship should be maintained. Your house is yours and our house is ours. We both knew our backyards! Fence yours and we fence ours! Respect the fence or else you are no longer a neighbor but an intruder. You may turn our nation into dust; and in this painful process our bodies will go back dusts on our ground and in that way, you cannot separate us from our land and claim until the last drop of our blood. Showing no respect to the result of Permanent Arbitration Tribunal that is to come, is an act of intrinsic greed resulting to oppression of the neighboring sovereignty. Let us go, grow, and glow in love, my neighbor! Rather than Gold -(craving for treasure to the extent of destroying our mutual understanding), Goons- (laying on the floor your powerful defense to the defenseless), Girl- somehow Philippines is like a lovely young lady raped by a merciless giant! What can you say about Labra's open letter? Please share your thoughts below. Comments or suggestions about "An Open Letter to China: 'We, know what is ours!' by Balweg Labra" is important to us, you may share it by using the comment box below.